How do I setup User Defaults in SQL-RD? 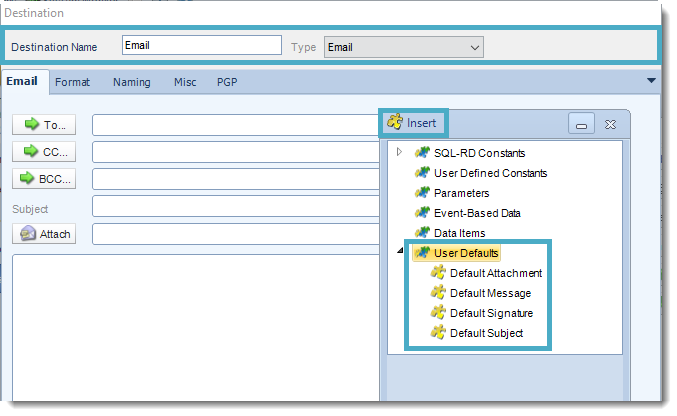 User Defaults are a set of preferences & values that can be reused across the application e.g Email templates, Database logon credentials etc. Here is how to access and set them up. When you first open SQL-RD's User Defaults window, you will see three tabs: Messaging Defaults, Database Defaults, and Miscellaneous. 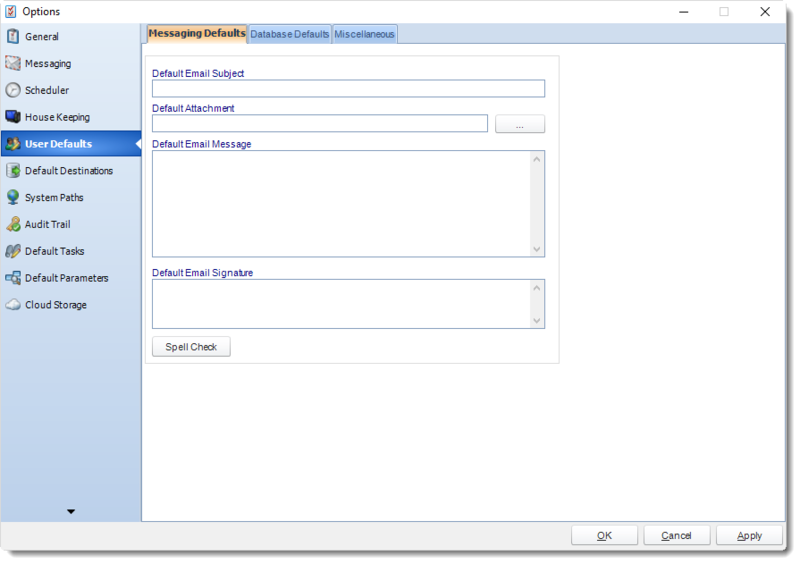 Using the Messaging Defaults tab, you can set up a standard email message or signature. 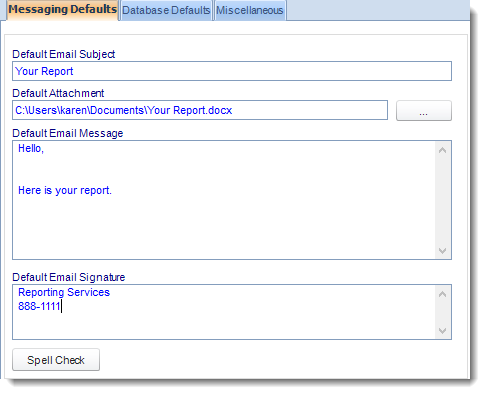 Then, you can use that message and signature as the email text for scheduled reports (via the use of an Insert). To set a default Email Subject, Email Message, or Email Signature, simply enter the text you wish to use in the applicable field. To set a default Attachment, click (...) button and select the appropriate file. Then, click Open. Once the Messaging Defaults have been set, click Apply. How to use Messaging Defaults? Once you have set Messaging Defaults in the Options window, they can be used in the email output of your schedule. 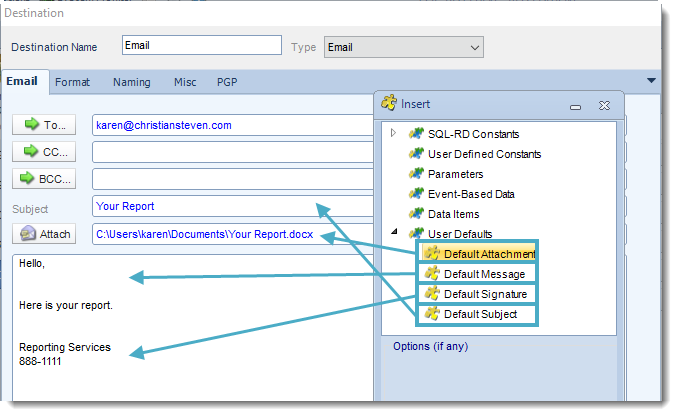 Defaults are applied on a schedule by schedule basis by using the User Defaults inserts on the Email Destination window. In your email output section, go to User Defaults in the Inserts Menu. Drag and drop the default item to the appropriate field. You can then edit the default message if needed. For each schedule, you can overwrite the default email text and enter your own. For more information on how to do this, see the Export to Email page. If your SSRS datasets all log into the same database, you can store the database credentials here and save having to enter them into each and every schedule. Under the Miscellaneous tab of the User Defaults, you will see two sections: Default Report Location and Default Date Stamp. 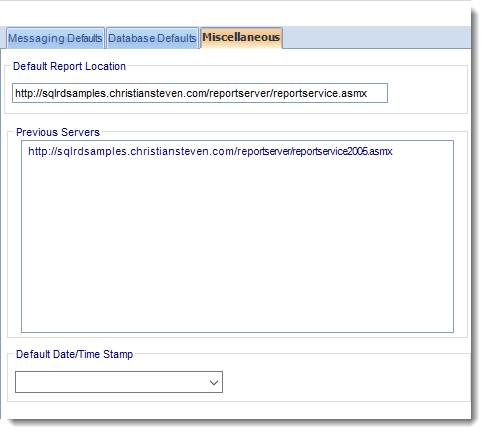 Default Report Location: is the path SQL-RD will always take you to when you are browsing for a SSRS report. If this field is blank, SQL-RD will begin browsing at the last location you selected a report from. If this field has a path listed, SQL-RD will automatically begin browsing from this location. Default Date/Time Stamp: will be what is used when you select to append a date/time stamp of a report destination. If this field has a value, this default format will be prefilled in the Append date/time to report output field when it is selected, saving you from having to select a format each time you write a schedule.